This section describes how to create groups within Filr. You can also synchronize groups of users from your LDAP directory to your Novell Filr site, as described in Section 14.1, Synchronizing Users and Groups from an LDAP Directory. You can use existing groups or create additional groups within Filr to facilitate sharing on your Filr site. For background information on sharing, see Section 3.0, Setting Up Sharing. To facilitate managing data quotas, as described in Section 17.2, Managing User Data Quotas. This section describes how to create static groups directly from Filr. Alternatively, you can synchronize static groups to Filr from your LDAP directory as described in Section 14.1, Synchronizing Users and Groups from an LDAP Directory. Name: Specify the unique name under which the group is stored in the Filr database. You can use only alphanumeric characters (a-z, A-Z, 0-9), hyphens (-), and underscores (_). 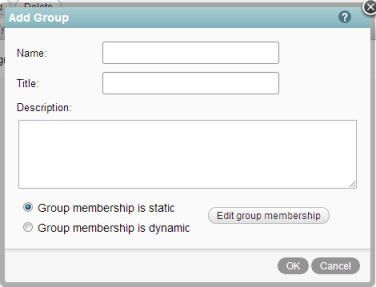 Title: Specify the group name that displays to users on the Filr site. This string can include any characters that you can type. 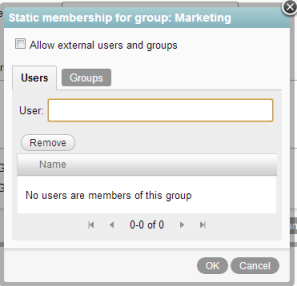 Select Allow external users and groups if you want to allow external users and groups to be members of the group that you are creating. Repeat Step 8 and Step 9 to add multiple users and groups to the group that you are creating, then click OK when you have finished adding users and groups. Groups based on LDAP queries are dynamic because they can be configured to have their membership updated when the information in the LDAP directory changes. Dynamic groups created within LDAP are stored in your LDAP directory and can then be synchronized to Filr, as described in Section 14.1, Synchronizing Users and Groups from an LDAP Directory. 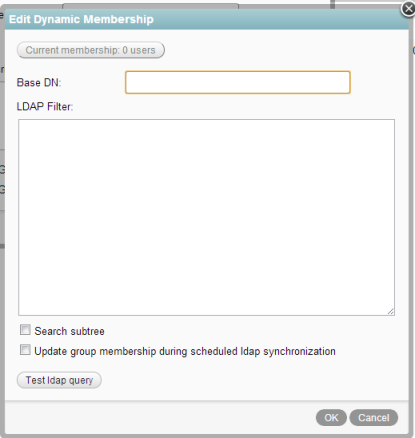 You can create dynamic groups in Filr by querying the LDAP directory. When you configure your LDAP connection, you must specify the name of the LDAP attribute that uniquely identifies the user (the value of this attribute never changes). For eDirectory, this value is GUID. For Active Directory, this value is objectGUID. For more information about this attribute, see LDAP Attribute to Identify a User or Group. The Filr process that creates a dynamic group uses the LDAP configuration settings in Filr to authenticate to the LDAP directory server. The credentials that are used are the LDAP server URL, user DN, and password. For more information on how to configure these and other LDAP configuration settings in Filr, see Section 14.1, Synchronizing Users and Groups from an LDAP Directory. Allows the Filr administrator to control group membership without having direct access to the group object in the LDAP user store. You do not want dynamic groups to sync to applications other than Filr that are leveraging your LDAP directory. You should not create dynamic groups in Filr if the base DN that you define for the dynamic group does not exist in each LDAP source. This is because the membership of the dynamic group might not be updated correctly. If your Filr site is configured with multiple LDAP sources and the base DN that you define for the dynamic group exists in each LDAP source, the membership of the dynamic group contains users from each LDAP source that match the dynamic group’s filter. Name: Specify the unique name under which the group is stored in the Filr database. You can use alphanumeric characters (a-z, A-Z, 0-9), hyphens (-), and underscores (_). For information on how to set the LDAP synchronization schedule, see Synchronization Schedule.